Friends of Ohlone Park (FOOP) is planning a 50th Anniversary festival in the park for Saturday June 1st. Tentative plans are for events throughout the park on that day: a story telling area, games, booths for Native American crafts, and acoustic music. In 1969 a group of neighbors occupied the strip of land along Hearst that BART filled in after digging a tunnel for the new rapid transit system. 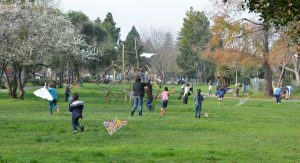 They planted trees, built a series of local DIY play structures (like the one pictured above), and cultivated gardens. Volunteer parties on weekends and sometimes during the week brought out dozens of neighbors. Often music and food tempted many more to visit and enjoy the merriment.